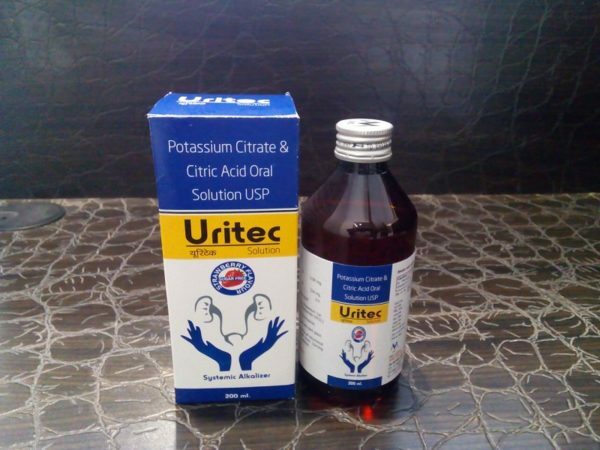 Citric acid + potassium citrate is a potent alkalizing agent, prescribed for the maintenance of alkaline urine for patients with renal calculi including cystine, urate and acidic stones. Citric acid + potassium citrate is a good uricosuric agent in gout therapy. Citric acid + potassium citrate is also prescribed for treatment of renal tubular acidosis. Citric acid + potassium citrate is contraindicated in patients with azotemia, hyperkalemia, myocardial damage, untreated with Addison’s disease, acute dehydration, adynamia episodica hereditaria, anuria and cramps. Dilute Citric acid + potassium citrate adequately with water to reduce GI injury and saline laxative effects. Citric acid + Potassium citrate may interact with non-enteric coated thiazides, other potassium salts, ACE inhibitors, potassium-sparing diuretics and cardiac glycosides. Take 15 to 30 ml of diluted Citric acid + potassium citrate with one glass of water after meals or at bedtime. Give 5-15 ml of diluted Citric acid + potassium citrate with half glass of water after meals or at bedtime. Citric acid + potassium citrate can be taken before or after food intake. USFDA Pregnancy category of Citric acid monohydrate + potassium citrate is unknown. Consult a physician before taking Citric acid monohydrate + potassium citrate.